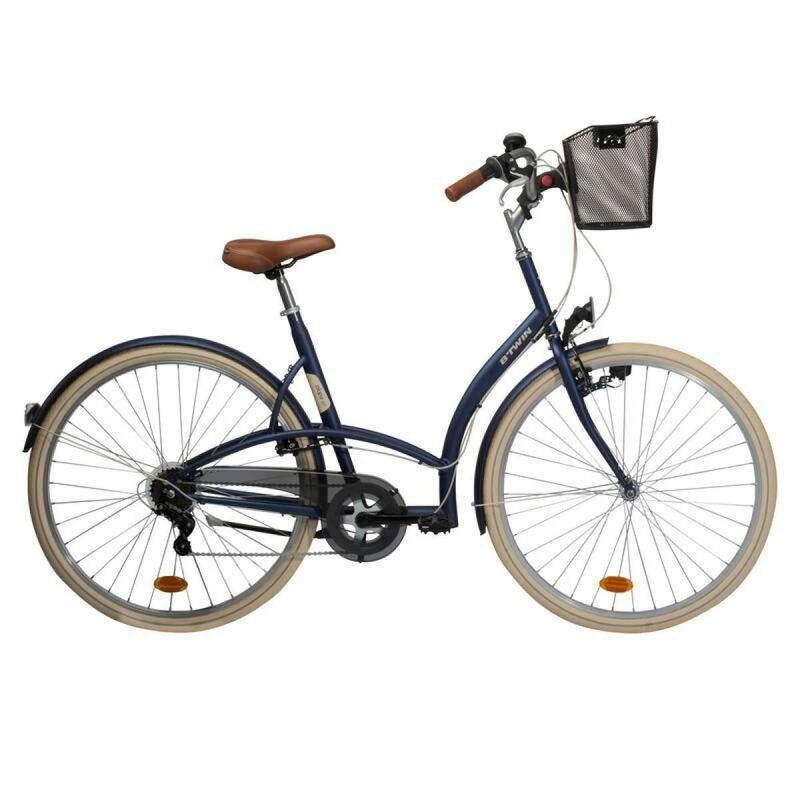 I am selling my B'TWIN Elops 320 Classic Style Bike - Blue as I am leaving London. I bought the bike at Decathlon in 2015, and it is under guarantee (Lifetime warranty on the frame, stem, handlebar and rigid fork). High-strength steel. Unisex town frame geometry (lowered frame to make it easier to get on to the bike). The frame has a special geometry for riding in town (keeps your back straight). Sizes available: S/M (1.55-1.75 m, 26" wheels) or L/XL (1.75-1.95 m, 28" wheels). 6-speed rear derailleur, single-chainring, steel crank. The 6 speeds match the typical need for an urban setting. Front and rear steel V-brake callipers. Aluminium brake levers. Efficient and safe braking. Low maintenance with few adjustments. The brake pads can be easily replaced. Steel handlebars with a specially designed geometry; steel damper stem. Anti-theft saddle clamp. The riding position has been designed to provide good road handling and visibility. The raised handlebar helps you maintain an upright and ergonomic posture. Steel headset size: 1 inch (threaded). The exclusive B'Twin saddle has a wide design for maximum comfort while riding in an urban environment. Made of synthetic material for easy care. Painted, single-wall rims for greater resistance to the elements. Bolt-on hubs to prevent theft in town. The balloon tyres are specially designed for urban cycling and provide a smooth, comfortable ride with good traction. Town-specific tyres (diameter: 26" / 650 mm or 28" / 700 mm). 26" town tyres with stiff beads. Inner tubes are equipped with car valves: tyres can be inflated at a service station. Tyres require consistent pressure (between 3.5 and 4.5 bars) to prevent punctures and rim distortion. Weight, size S/M: 16.4 kg.